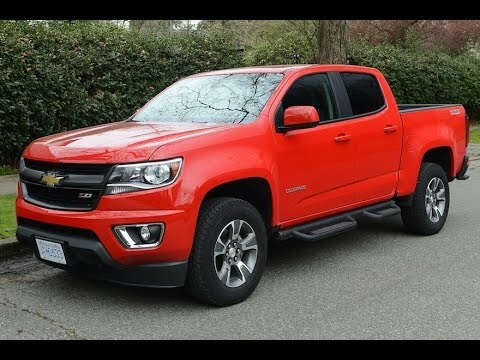 The all-new 2015 Chevrolet Colorado can tow a good-sized trailer and carry payload, yet is small enough to park in a garage. Its attractive styling, interior refinement and efficient-yet-powerful engines set it apart from the rest of the compact/midsize pickup truck segment. The new Colorado's refinement and its cool tech features may appeal to owners of crossover SUVs. 2015 Colorado is a great truck overall. Overall I love my truck but it does have issues that I can complain about. Overall the transmission is great. Sometimes, however, the transmission acts like it does not know what gear it wants to be in. It will either not shift as quickly as I think it should or it upshifts when it should have waited a few seconds longer. When the windows are up and I have the recirculate air button pushed there is a high pitched whistling noise that drives me nuts unless I turn the radio up to drown it out. The steering column has developed a nasty little squeak. Granted, the last two might be nitpicking since the vehicle is a couple years old. Things I do like.. The back seat has ample room for a 6'2" friend of mine. I like the space under the back seats. They also fold down so you can put things (or dogs) back there comfortably to transport them. The v6 engine has plenty of power. My truck definitely does not feel underpowered. I get 21 miles a gallon around town. The technology in it is great. I have USB ports, an auxiliary port, navigation, satellite radio, Pandora, access to the internet if I need it. A really great truck overall. The truck is good for a small family that is just starting out. The backseats do not offer too much leg room for older teenagers and adults. However, younger children will not have this issue. I have had issues with the driver and passenger door speakers shorting out, I do not know if that is and issue related to the Bose system or an issue across all Colorado. Chevys rock fords aren't as good. Good truck, I drive it to l. A every day it has over 100 thousand miles on it with very little maintenance. Pretty much just oil and tires. The back seat is small but the front seats are roomy. It has good power and good gas mileage. It's a safe vehicle I would know cause a lady slammed into me on the freeway and I was ok and so was my truck.